On the bus to Treblinka I sat quietly, and anxiously. When I first began working at Facing History, [Vice President and Chief Program Officer] Marc Skvirsky recommended that I read Into That Darkness: An Examination of Conscience, which is essentially the transcribed interview between reporter Gitta Sereny and Franz Stagle, the commandant of the death camp at Sobibor and later at Treblinka, after his arrest in 1971. This book had a significant impact on me. It made me contemplate the way that Stangl appeared to be able to do what he did, making it seem so easy for him to simply ignore the humanity in his victims. You can find a portion of this text here. We read a section of Into That Darkness while driving to the camp. Hearing Stangl's horrifying words read out loud was very powerful. I had read this book, had seen pictures of the memorial at Treblinka, and yet could not begin to imagine what the experience of being at Treblinka would be like. When I stepped off the bus, I was immediately taken aback by the smell of nature, the air had that beautiful smell of hikes in the woods and reminded me of camping with my family. The trees in the woods that surround the area that was once the death camp must have been filled with a huge number of birds, as the songs that they were singing were louder than any I have ever heard. Unfairly I wanted these signs of life and of nature to stop. My irrational and purely emotional reaction was that beauty should not be permitted to exist in this place. 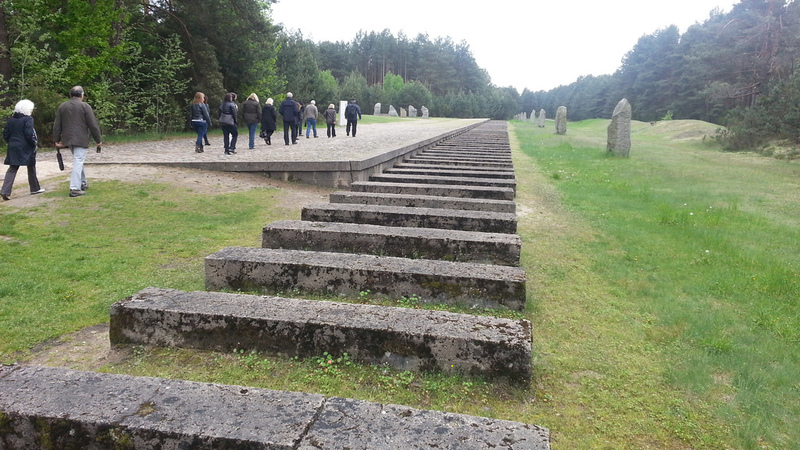 Symbolic concrete blocks mark the path of the former railway line at Treblinka. When I first saw the model of the camp, I focused in on what appeared to be two long tables with red embers that burned the entire length of each of the tables. Given that this is a miniature model, at first it was not entirely clear what lay on top of each table. I could, for the time being, not think about what, deep down, I already knew. Our guide walked us through the mechanism of murder at the camp, from the moment when the prisoners arrived, through the selection in which women and children and men and boys were separated. He told us about the gas chambers and finally about what I would learn was called "the grill." The tables that had first caught my eye were the final locations where people were burned. Their ashes were finally placed into large pits. This whole process from arrival until the horrific and unimaginable end took three hours. 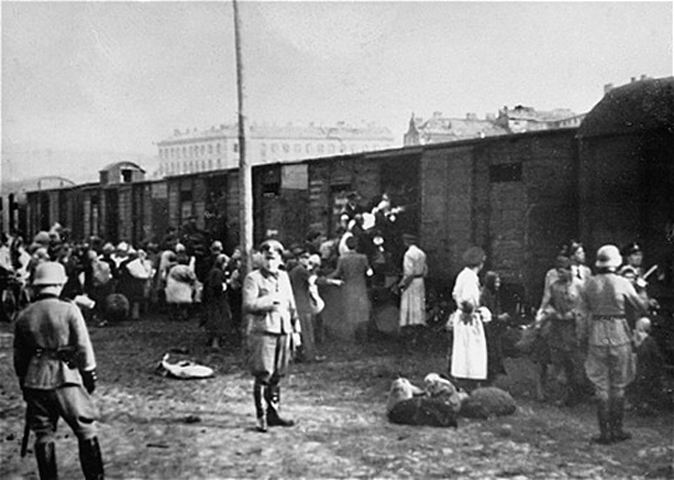 Jews loading onto trains at the Umschlagplatz in Warsaw during the German occupation of Poland. Umschlagplatz is German for collection or reloading point. This photo is of the square in Warsaw where, under German occupation, Jews gathered for deportation from the Warsaw Ghetto to Treblinka. As I entered the actual memorial, the vastness was the first thing that I noticed. Walking through on my own in silence, I could not help but think of what my own fate would have been in World War II Warsaw - a Jewish mother with two young children. It was all too difficult and painful to contemplate, and so for a moment I allowed myself to escape by focusing on the sounds of the birds and the smells of the woods that I had found so infuriating when I first arrived. Read more about the trip to Poland, including how the trip is sparking questions about identity for one of our LA bloggers and a look at how we remember and study Holocaust history from one of our edtech bloggers. Download a free copy of the Facing History resource The Jews of Poland to find primary sources, connection questions, and teaching strategies about this period of history.